When I got an email from Paul Melia announcing a new side-project from the pianist together with Nouveaunoise’s Niall Conway, I was intrigued. I’m a big fan of both their primary endeavours, and always felt that Paul didn’t get the recognition he deserves. Now with the release of ‘Bicycle Day in the Cosmos’, the first single from Kayfabe, he definitely will be noticed. Paul’s own solo output is gorgeous piano-led balladry, while Nouveaunoise make fantastically textured electronica. The two together, well it’s just wonderful. An early contender for Irish song of the year, the bizarrely titled ‘Bicycle Day in the Cosmos’ is a blissed-out electronic-pop classic. Forget all those Swedish exports, we’ve got poptronica’s best kept secret right here. Their bio states “Two rainbows collided and Kayfabe was born”. That’s what this song feels like. 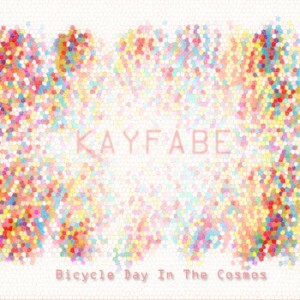 It’s a free download from Kayfabe’s bandcamp page, and you’re guaranteed to have it on repeat for a very long time.